Yes, when I find some time I’ll try either i3 or Xfce. Thanks! I use the nvidia-dkms package on the host (Arch). But now I’m confused. 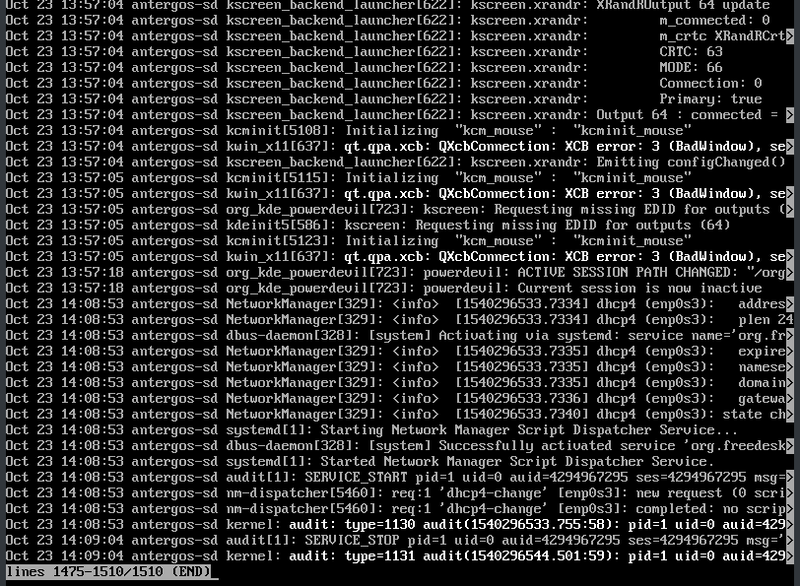 You asked about the output of pacman -Qm and lspci -vnn on the host (Arch) not the guest (Antergos), or not? The host (Arch) although it has so many AUR packages runs without any issues. The guest (Antergos) has far less packages. Thanks for the tip! Yes I know but it still works. yay is also installed in any case. Jan 20 15:08:23 antergos-sd systemd: Started Getty on tty2. appeared already in the morning at 08:42 as I powered on the VM and many times until the VM finally freezed at 15:05. @robgriff444 : Yes, but like I wrote before, it happens at irregular intervals. Maybe almost once a day. This is annoying because I’m doing serious stuff on it and every time it happens I have to reboot the VM which also means I might loose unsaved data. @joekamprad : 32GB memory on the main system, 10 GB is assigned to the Antergos VM. I’m running Antergos with KDE Plasma on a VirtualBox Machine. For a long time now the machine keeps freezing irregularly. I can move the mouse pointer around but I cannot click anything. The upgrade of VirtualBox from v5 to v6 didn’t help. There is 1 error in the first one (about XCB error) and 3 errors (about NMI watchdog, acpi and vboxsf) in the second one. although I don’t use 3D option.